Selling mineral spring water in times gone by was big business – rather like the present-day trade in bottled water. 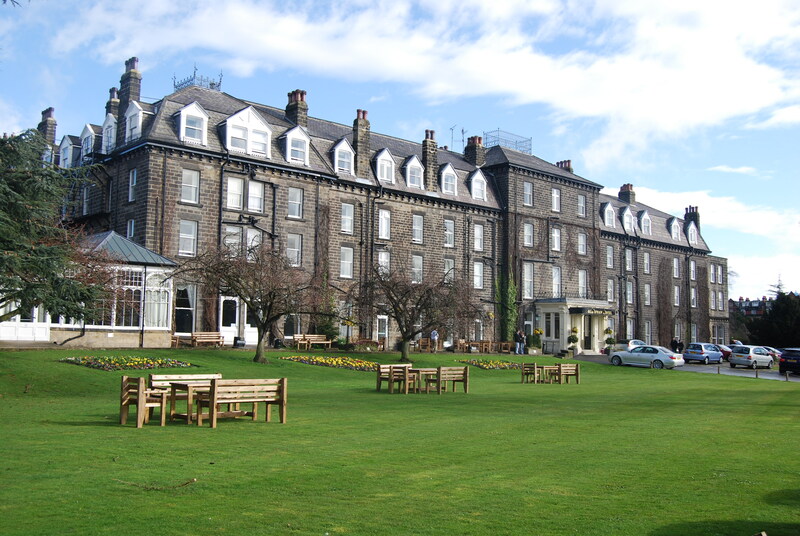 The extent of the commercial competitiveness between spa-resorts and indeed within a spa town like Harrogate was vicious. The Crown Inn, Harrogate, originally built in 1740, made money from its reputation for making bathing convenient and comfortable: a warm indoor bath with attendance cost 3s 6d, which must have been attractive to those who could afford it, in comparison with the discomforts of the public springs. In the 1830s an incoming speculator, John Williams, opened the Victoria Baths to provide private bathing facilities. Joseph Thackwray, proprietor of the Crown Hotel, retaliated by constructing the Montpellier or Crown Baths (1834). This provoked John Williams to build the Spa Rooms (1835) to exploit the so-called Cheltenham Springs, offering chalybeate water (including the strongest iron-chloride spring in the world) alongside the Old Sulphur Well. This flurry of competition in commercial bathing led to one of the more famous controversies of Harrogate’s history. In December 1835 Jonathan Shutt, the proprietor of the Swan Inn, casually discovered that a tenant of Joseph Thackwray was digging a deep well inside his shop on Swan Road. Shutt hastily consulted the proprietors of the Granby, Dragon, and Queen Hotels and John Williams of the Victoria Baths and Spa Rooms and they concluded that Thackwray was attempting to divert the waters of the Old Sulphur Well to establish a monopoly. The case eventually came to York Assizes, where Thackwray secured a technical acquittal. 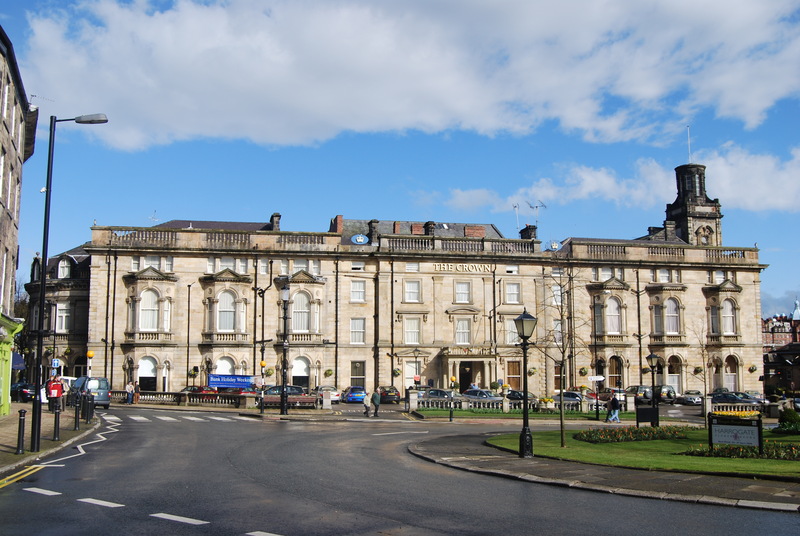 As a result, his rivals joined with the Duchy of Lancaster to promote the Harrogate Improvement Act of 1841, which placed control of public amenities in the town firmly in the hands of twenty-one elected Improvement Commissioners. Joseph Thackwray could be credited with giving a whole new meaning to the phrase “taking the waters”. This entry was posted in Fun Palaces, Taking the Waters: the history of spas & hydros – North Yorkshire, Victorian Architecture on December 28, 2013 by Mike Higginbottom. 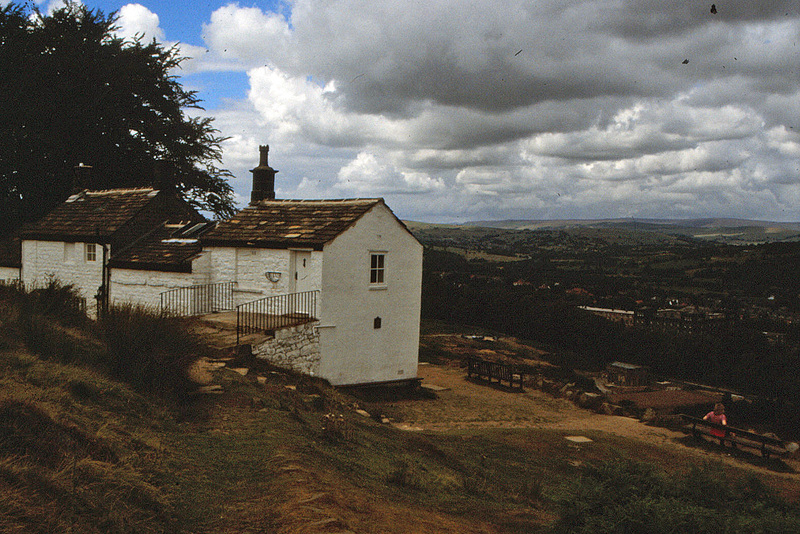 The White Wells spring on the moorland above Ilkley was never a sophisticated resort. The facilities are even today rudimentary, and it’s a stiff climb up the hill from the town. Patience is a virtue which will every day be called into action here; the best time for getting a bath soon after going to the wells, is between five and eight in the morning. It is extremely unpleasant to be at the wells during a storm or heavy shower, as the hill is made so slippery, that in going down a person may think himself extremely fortunate, should he arrive at home, without a fall or two, not to mention the pleasure of riding, ie, sliding half way down the hill. …this water is of the greatest esteem and repute of any of the north of England, in the King’s Evil [scrofula] and other old ulcers; yet it derives these effects neither from its fixt nor volatile parts, but wholly from the coldness and the purity of the elements, its drying nature from the lime-stone it washes, tho’ a great part of it comes from blue clay. In other words, this mineral water has nothing in it at all. That’s why it does you good. For details of Mike Higginbottom’s lectures on spas and holiday resorts, please click here. This entry was posted in Fun Palaces, Taking the Waters: the history of spas & hydros – North Yorkshire on December 27, 2013 by Mike Higginbottom. I took my cousin Cathryn and her family to the Old Swan when she received her Open University degree (thereby absolving me of being the only black sheep – that is, graduate – in the family). We waded for above two hours through sandwiches, and cake, and scones, and pots of tea, and eventually admitted defeat. It was wonderful. I didn’t need to eat again till breakfast. The Old Swan is also a relevant historic site because, although there was a hotel on the site in the eighteenth century, the present building is a fine example of a Victorian hydro, designed to offer the hugely popular “water cure”. Built for the Harrogate Hydropathic Company in the late 1870s, the building is a conscious imitation of the even bigger Smedley’s Hydro at Matlock Bank. Its major claim to fame, however, dates from 1926 when the crime novelist Agatha Christie (1890-1976) holed up at what was by then called the Swan Hotel for eleven days after her husband, Archie, declared he wanted a divorce so he could marry his mistress, Nancy Neele. After a huge row he left their Berkshire house to spend the weekend with Nancy, and Agatha subsequently left, abandoned her Morris Cowley near Guildford and completely disappeared, as only a writer of murder mysteries can. The ensuing search had elements of farce – the Home Secretary, William Joynson-Hicks, harassing the police for a “result”, Arthur Conan Doyle having one of Agatha’s gloves examined by a medium and Dorothy L Sayers inspecting the location of the abandoned car, later referenced in her novel Unnatural Death. Eventually Agatha Christie was found, having an enjoyable time at the Swan, registered under the name Mrs Teresa Neele. That gave Archie something to think about. Archie and Agatha Christie divorced in 1928, and two years later she married the archaeologist (Sir) Max Mallowan (1904-1978). He once said that she said, “An archaeologist is the best husband any woman can have; the older she gets, the more interested he is in her,” but she denied it. This entry was posted in Fun Palaces, Taking the Waters: the history of spas & hydros – North Yorkshire, Victorian Architecture on December 27, 2013 by Mike Higginbottom. Harrogate’s unique selling point as a spa is the sheer variety of its mineral springs. The original spring that William Slingsby’s horse tripped over in 1571 was chalybeate, or iron-bearing: this is now known as Tewit Well. 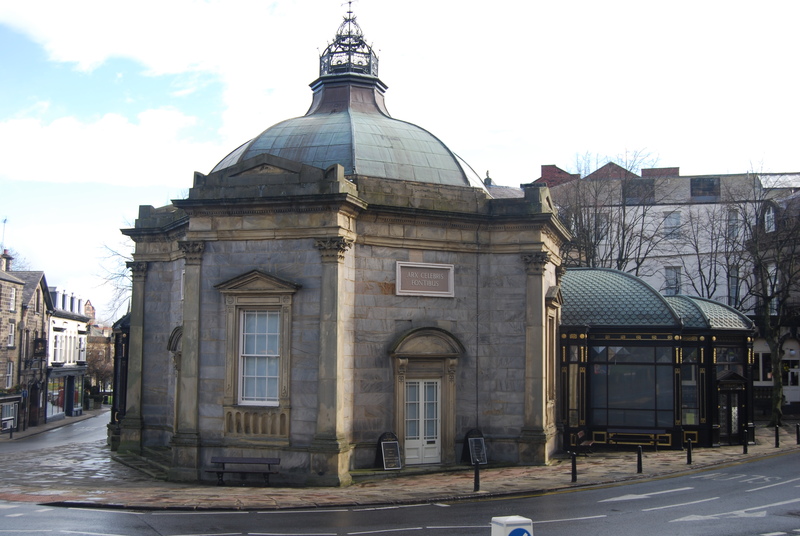 During the Thirty Year’s War, a “stinking well” at “old Haregate-head” was developed: this Old Sulphur Well now lies beneath the Royal Pump Room which is now a museum [http://www.harrogate.gov.uk/immediacy-987]. The first inst we arrived att the nasty Spaw, and have not began to drinke the horid sulfer watter, which all thowgh as bad as posable to be immajaned, yet in my judgment plesant, to all the doings we have within doorse, the house and all that is in it being horidly nasty and crowded up with all sorte of company, which we Eate with in a roome as the spiders are redy to drope into my mouthe, and sure hath nethor been well cleaned nor ared this doseuen yerese, it makes me much moare sicke than the nasty water. Celia Fiennes, visiting in 1697, couldn’t persuade her horse to go anywhere near the sulphur well, yet considered the disgusting waters “a good sort of Purge if you can hold your breath so as to drinke them down”. Traditionally, anyone is free to try the waters from a tap outside the Royal Pump Room. Within the museum I have seen ladies behind a counter, bearing Mona Lisa smiles, prevailing on visitors to sample the water. This is a characteristic Yorkshire welcome. The pie and a pint were served without a word. “What about the friendly word?” he asked. “Don’t eat the pie,” said the landlord.